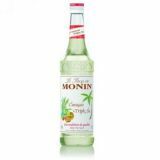 Monin Pina Colada syrup in a stylish 70cl glass bottle. 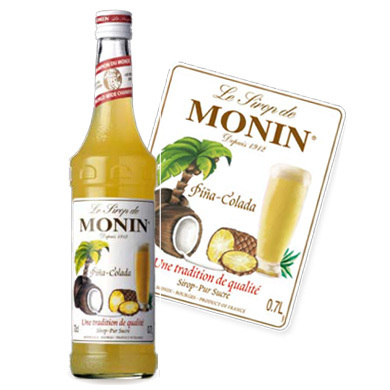 Enjoy the taste of Puerto Rico with the intense Monin Pina Colada syrup! Just picture yourself savouring sunny beverages in a sensuous atmosphere Pina Colada means strained pineapple and Monin's new flavour combines the natural essence of a fresh pineapple with the sweetness of the coconut fruit. Puerto Rican inspired Pina Colada will allow you to create easily delightful aromas in plenty of summer alcoholic and non-alcoholic beverages just by pouring and stirring! Try it out in cocktails or mocktails, desserts... you might even want to try it in beers, it's delicious! Taste: Balanced nose of pineapple and coconut, ripe pineapple taste with notes of desiccated coconut. Applications: Mochas, cocoas, beers, cocktails, teas, fruit punches, smoothies. 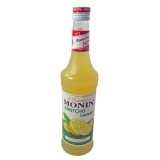 Founded in 1912 by George Monin this very traditional French company is still owned by the Monin family. Today George's grandson Oliver runs a company with manufacturing plants on 3 continents and sells a range of over 140 flavours of syrup. In 2013 Monin launched Monin Studio London in Hoxton Square, Shoreditch. Visitors to the Studio can make every drink imaginable using Monin's range of premium syrups, fruit purees, smoothie mixes, sweet sauces and frappe powders. The Monin Studio London is the perfect showcase for the flexibility of our product range. Baristas and bartenders are our greatest ambassadors, and I always admire their creativity and passion for our brand. Now they have a dedicated space to experiment and develop their drinks menus in one of the cocktail capitals of the world. You have a legal right to change your mind about a purchase within 14 working days of receiving it - this is called your 'Right to Cancel'. However you must not have broken the seal of foods - you can't try a food, decide you don't like it and ask for your money back. But if the food tastes off or has been contaminated etc please contact us. If you received the item more than 14 working days ago and you have a problem with it contact us and we will help. For more information about returning a item to us please click HERE. 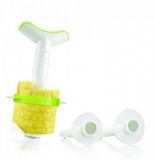 Sugar, water,flavouring, concentrated lemon juice, emulsifiers: acacia gum, E445, colouring agent: E161b. 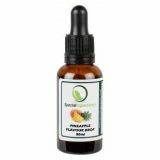 Total fruit juice: 23% minimum, including 12% pineapple juice. Once opened syrups should be stored in a cool place, out of direct sunlight and away from heat sources like boilers or stoves. Syrup pumps should be washed or sterlised with baby milk bottle cleaner prior to first use and when moving from one bottle to another. Please note: Not compatible with steamed milk, coffee or tea. Bennett Opie Limited, Chalkwell Road, Sittingbourne, Kent ME10 2LE. Values may vary from batch to batch due to variations which can occur in natural ingredients. We take great care to make sure that our food information is correct and up to date. However foods are constantly being reformulated, so ingredients, nutrition content, dietary information and allergens etc may change. You should always read the label and not rely solely on the information provided on our website. You will see above the date we last updated the information. You will also see this date on the Food Information Data Sheet. We are unable to accept liability for any incorrect information. This does not affect your statutory rights. If you have any questions or would like some advice about an item then please call (02392 378700) or email us (customerservices@cateringandleisure.co.uk). You are also welcome to contact the food manufacturer - their details are above.